GT Capital Holdings, Inc. (“GT Capital” or the “Corporation”, and together with its subsidiaries, the “Group”) aspires to obtain a solid track record in corporate governance in the Philippines and in the ASEAN Region. In pursuit of its goal and in order to maintain the trust and respect of its stakeholders, GT Capital gives primary importance to its policies and practices that implement and imbibe the spirit of the principles outlined in the SEC Revised Code of Corporate Governance, the G20/OECD Principles of Corporate Governance, Association of Southeast Asian Nations (“ASEAN”) Corporate Governance Scorecard, and the Philippine Stock Exchange, Inc. (“PSE”) Corporate Governance Guidelines. GT Capital’s efforts and commitment to raise its level of corporate governance has garnered recognition in the investment community. This affirms the Corporation’s standing as one of the top 50 publicly-listed companies (“PLCs”) in corporate governance in the ASEAN region and one of the two most improved PLCs in the Philippines awarded by the ASEAN Capital Markets Forum in 2015. 8. Board agenda to include reports of committees with critical issues. GT Capital is fully compliant with the Revised Code of Corporate Governance as well as with all pertinent laws, rules and regulations imposed in the conduct of its business. As a PLC, GT Capital recognizes its duty and responsibility to provide timely and accurate information to the investing public. To this end, GT Capital strictly complies with all reportorial and disclosure requirements imposed by regulatory agencies such as the Securities and Exchange Commission (“SEC”), the Philippine Stock Exchange (“PSE”), and the Philippine Dealing and Exchange Corporation as well as ensures the posting of the same onto GT Capital’s website: www.gtcapital.com.ph. Good corporate governance practices are expected in all levels of the organization. In order to ensure good corporate governance, GT Capital established the following policies as part of its corporate governance framework as it continues to cultivate a culture of compliance and governance that is inculcated within the Corporation. The Code of Ethics serves as a guide to ensure that GT Capital’s directors, officers, and employees adhere to the highest ethical standards in the conduct of its business, keeping in mind GT Capital’s corporate core values of integrity, excellence, respect, entrepreneurial spirit, and commitment to value creation. The Code of Ethics is implemented through the Manual on Corporate Governance (“CG Manual”), Whistleblowing Policy, Code of Discipline of Employees, and the Policies and Procedures Manual of each department. These documents have been distributed to and are readily available for access of all directors, officers, and employees through the website, by request from the Legal and Compliance Department, and through the Human Resources (“HR”) and Administration Department, and are reviewed on an annual basis in the context of evolving best practices and changing regulations. GT Capital’s HR and Administration Department, in coordination with the relevant heads of other departments, monitors and ensures compliance with the aforementioned policies and if necessary, imposes the appropriate disciplinary action. In addition, each department is audited by GT Capital’s Internal Audit Department to further verify observance of the relevant policies. The Code of Discipline ensures that employees of GT Capital conduct themselves in a manner befitting their respective positions in the Company by always keeping in mind and practicing the general principles of professionalism, high ethical standards, discipline, integrity, and honesty. The Code of Discipline has been distributed to all employees of GT Capital and is also available on GT Capital’s website. Bribery and offering or accepting anything of value for personal gain in the conduct of official business is considered a serious offense with a penalty of dismissal under the Code of Discipline. The HR and Administration Department is responsible for monitoring and implementing the Code of Discipline. There have been no major violations since its adoption in 2013. GT Capital’s Whistleblowing Policy was adopted to further strengthen GT Capital’s Corporate Governance framework. It ensures that GT Capital maintains the highest standards of transparency, probity and accountability. The Whistleblowing Policy strictly prohibits fraudulent practices and unethical conduct by any of its board members, officers and employees. It defines who is considered a whistleblower and the general guidelines and procedure to be followed if a whistleblower has a reasonable and good faith belief that GT Capital or any person connected with the Company has performed any act, or has failed to perform any act that is illegal, fraudulent and unethical. The Whistleblowing Policy provides for a confidentiality provision that strives to maintain the anonymity of the whistleblower without his or her explicit consent. It likewise provides for a non-retaliation policy which states that the Company may take disciplinary action against an officer or employee who has engaged in retaliatory conduct. The Whistleblowing Policy is accessible through the GT Capital website, and is also attached to GT Capital’s CG Manual. Reports by stakeholders, including employees, may be submitted by e-mail to governance@gtcapital.com.ph or directly in writing to the Chief Audit Executive (“CAE”). The CAE may then investigate the report, appoint an investigating officer, create a special Task Force (internal or outsourced) to investigate the matter independently, or elevate the report to the Discipline, Ethics and Values Committee composed of the CAE and the respective heads of the HR and Administration Department and Legal and Compliance Department. Investigations shall be completed within sixty (60) calendar days from receipt of the report by the CAE. GT Capital has adopted an Enterprise Risk Management (“ERM”) Policy and Framework for the promotion of increased awareness of risks, minimization of the company’s exposure to financial losses, and strengthening of shareholders’ confidence. GT Capital seeks to maintain an effective risk management process, designed to meet the requirements of generally accepted good corporate governance. 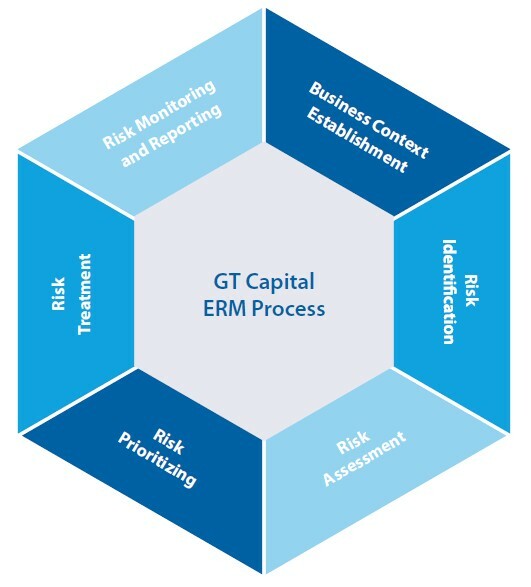 The goal of the enterprise risk management process is to apply a consistent methodology to assess and manage business risks across GT Capital. GT Capital undertakes an annual assessment of its risks using a methodology aligned with global risk management standards - ISO31000 and COSO Framework. GT Capital’s risk governance structure ensures that risk management is not the sole responsibility of one individual but rather occurs and is supported at all levels in the Corporation. The effectiveness of the risk governance structure and process is supported by well-defined risk management roles and responsibilities and periodic review conducted by the Internal Audit Department. The Board of Directors, through the Risk Oversight Committee, has the ultimate oversight role over the Corporation’s risk management activities, and approves risk management related policies, procedures, and parameters that govern the management of risks. The Board of Directors, with guidance from the Executive Committee, determines the strategic direction of GT Capital and creates the environment and the structures to properly align risk management with strategic objectives. The CRO is the Corporation’s risk advocate who facilitates the execution of the ERM process. His primary responsibility is to own, develop, implement, and continuously improve the ERM process. He is assisted by a full time risk management officer. The Risk Steering Committee members are the risk owners, and are responsible for the identification, assessment, monitoring, and establishment of next steps based on the key risks GT Capital faces. In accordance with the Risk Charter, the risk management system is subjected to regular internal audits to identify any gaps in the performance of the process. The audit results are reported to the Audit Committee and Senior Management, and are addressed accordingly. In 2017, individual interviews and group workshops were conducted for the Annual ERM Reassessment. A total of 27 risks were identified, four of which were assessed as Key Risks using the agreed-upon Risk Ranking Criteria. Risk Treatment Action Plans were developed for each Key Risk. A Risk Dashboard containing key risk indicators for each identified risk was developed and monitored to assess on an on going basis that the risks are effectively managed. GT Capital component companies are engaged in various sectors namely banking, insurance, property development, automotive assembly and distribution, and infrastructure and utilities. GT Capital component companies may be adversely affected by market factors such as interest rates, foreign exchange rates, inflation, and other economic variables. Political policies and directions may also impinge the market demand for Component Company products and services. To mitigate this risk, GT Capital and its component companies continuously monitor key risk indicators, conduct sensitivity analyses, and adjust their business strategies accordingly. GT Capital component companies are regulated by the Bangko Sentral ng Pilipinas, Insurance Commission, Housing and Land Use Regulatory Board, SEC, Bureau of Internal Revenue, and other regulatory bodies. Rules and implementing guidelines are always evolving and GT Capital should always be up to date with these new developments. To mitigate this risk, GT Capital component companies have their own legal and compliance departments to ensure proper compliance with relevant regulations. In addition, the internal audit department of each component company reports any material non-compliance to their respective Audit Committees. It is of utmost importance to GT Capital and its component companies to be transparent to its shareholders, in terms of financial reporting. To achieve this, each of GT Capital’s component companies has engaged SGV & Co. as their external auditor. In addition, GT Capital conducts its own review of the submitted financial reports for consolidation. Afterwards, the consolidated financial statements at the GT Capital level are then subject to another external audit by SGV & Co.
As a holding company, GT Capital aims to have a diversified portfolio that maximizes profitability and creates shareholder value. To achieve this, GT Capital management meets on a monthly basis to monitor and review the performance of the portfolio and accordingly recommends the adjustment of business strategies to the Executive Committee and the Board. In addition to the four key risks above, there are 23 other risks which were identified by GT Capital management during the 2017 Enterprise Risk Management Annual Reassessment. Each risk has corresponding key risk indicators that are monitored on a quarterly basis and serve as an early warning signal for GT Capital, in case an emerging risk was to transpire. These indicators are reported to the Board Risk Oversight Committee on a quarterly basis. Under GT Capital’s CG Manual, directors are required to conduct fair business transactions with the Corporation and ensure that his personal interest does not conflict with the interests of the Corporation. GT Capital’s directors are thus prohibited from using their position to profit or gain benefits or advantages for themselves or their related interests, and are obliged to avoid situations which may compromise their impartiality. In instances when there is an actual or potential conflict of interest, the conflicted director is required to fully and immediately disclose such conflict of interest and abstain from participating in the Board discussion of that item on the agenda. Consistent with the Securities Regulation Code and other pertinent laws and issuances, GT Capital’s policies ensures that its directors, officers, and employees keep secure and confidential all non-public information which they may acquire or learn by reason of their position. To this end, the directors, officers and employees are prohibited from dealing in GT Capital shares from the time they receive or become aware of material non-public information and for up to two (2) full trading days after its disclosure to the investing public (the “Blackout Period”). A director convicted of insider trading shall be removed from his position while officers and employees shall be subject to dismissal. Outside the Blackout Period, GT Capital requires its directors, officers, and its principal stockholder (Grand Titan Capital Holdings, Inc.) to report any acquisition or disposal of GT Capital shares on the same day as the transaction. This ensures that GT Capital complies with PSE’s Revised Disclosure Rules and the Implementing Rules and Regulations of the Securities Regulation Code. The appropriate disclosures are submitted to the PSE and SEC (through SEC Form 23-B) before the relevant information is posted on GT Capital’s website. In 2017, GT Capital submitted details on all transactions made by insiders and has not been penalized for any violation of applicable laws, rules, and regulations in relation to insider trading. The procurement policies of GT Capital ensure that risk exposure due to unreasonable and exorbitant spending is eliminated. The Corporation maintains a list of accredited suppliers for office supplies and equipment which have been pre-screened to provide competitive prices. Contracts for availment of crucial services are reviewed and approved by the Bids and Awards Committee or the Executive Committee for extraordinary service engagements. As the body responsible for fostering the long-term success of the Corporation and securing its sustained growth and competitiveness in a manner consistent with its fiduciary responsibility towards the Company and its stakeholders, GT Capital’s Board sets the policies for the accomplishment of corporate objectives and provides an independent check on management. The Board is also primarily responsible for the governance of the Corporation and ensures that GT Capital is in compliance with the principles of good governance. The Nominations Committee of GT Capital conducts an annual screening of GT Capital’s Board and an annual election is conducted by GT Capital’s stockholders. The Corporation availed of the Board Director Sourcing services of the Institute of Corporate Directors when searching for candidates for the Board. As of December 31, 2017, three (3) members of GT Capital’s Board are Independent Directors, meeting the required number of at least three (3) Independent Directors provided for under applicable rules and regulations of the SEC as well as the requirements of its CG Manual. GT Capital’s CG Manual defines an Independent Director as a person who, apart from his fees and shareholdings, is independent of management and substantial shareholders. Additionally, Independent Directors are free from any business or other relationship which could, or could reasonably be perceived to materially interfere with his exercise of independent judgment in carrying out his responsibilities as a director. GT Capital’s CG Manual provides that no director shall simultaneously hold more than five (5) board seats in publicly listed companies. The Company does not have directors, including Independent Directors, who serve on a total of more than five (5) boards of publicly listed companies. The CG Manual requires the roles of the Chairman and the President to be separate, in order to foster an appropriate check and balance of powers, to increase accountability, and ensure the Board’s capacity for decision-making separate and independent from Management. The Chairman of the Board ensures that meetings of the Board are in accordance with the By-Laws, supervises the preparation of the agenda, maintains qualitative and timely lines of communication between the Board and Management, listens to and addresses governance-related issues that may be raised by non-executive or Independent Directors and ensures that the Board exercises strong oversight over the Company and its Management. Arthur Vy Ty has served as Chairman of GT Capital since his election on May 11, 2016. Carmelo Maria Luza Bautista has served as President since GT Capital’s listing in April 2012. The Board provides guidelines and insights on major investments and capital expenditures to ensure that the Company fulfills its corporate objectives in a manner consistent with its fiduciary responsibility to its stockholders and other stakeholders. It adopts a system of checks and balances and conducts a regular review of the effectiveness of the system to ensure the integrity of the decision-making and reporting processes at all times. The Board likewise ensures that its activities and decisions are within its authority under the Corporation’s Amended Articles of Incorporation and By-Laws, and are in compliance with all applicable laws, regulations and business practices. The Board likewise formulates and implements policies and procedures to ensure the integrity and transparency of related party transactions between and among GT Capital and its parent company, joint ventures, subsidiaries, associates, affiliates, major stockholders, officers and directors. The non-executive directors of the company met separately at least once during the year without any executives present. GT Capital adopted its Board, Committee and Individual Director’s Self-Assessment Forms in order for the Corporation to annually evaluate the performance of its Board, Committee and individual directors and to assess the efficiency of its processes in relation to the Board and its committees. In addition, these forms aid the Corporation in identifying areas for improvement and determine the value and contribution of the Board and each individual director towards the growth and improvement of the Company. The Self-Assessment forms are distributed to the directors, who accomplish and return the same within a set period of time. Some questions in the forms require a “yes” or “no” response, while others are answered based on a scale ranging from “strongly disagree” to “strongly agree”. Directors also provide comments and suggestions to improve the Board’s performance and provide their input on what areas they recommend GT Capital focus on in the following year. Results are tabulated by board secretariat and reported to the Board or the appropriate Committee. The President’s Assessment Questionnaire is a tool used to evaluate the performance of the President of GT Capital and to identify areas of improvement. It is distributed annually to the Board and the results are provided to the President. The Questionnaire is divided into the following sub-sections: leadership, strategy formulation, strategy execution, financial planning/performance, relationship with the Board and personal qualities. The Board rated the President on a scale of one (1) as the lowest to five (5) as the highest. A column was also provided for the Board’s comments and suggestions, as well as a separate portion requesting input regarding the President’s Development Needs. The Board exercises authority over specific aspects of GT Capital’s business through the various Board Committees. The Board Committees likewise aid the Board in complying with the principles of good corporate governance. Each Committee is governed by a Committee Charter under the Manual, which serves as a guide for each Committee in the performance of its functions. The CG Manual and Committee Charters are reviewed and amended annually to reflect corporate governance best practices adopted by the Corporation. The latest version of each Committee Charter may be downloaded from the GT Capital website. GT Capital’s Executive Committee guides Management in the evaluation and discussion of the acts or courses of action to be taken prior to its endorsement to the Board, if required under the CG Manual and Amended By-Laws of GT Capital. The Executive Committee likewise exercises all the powers and authority of the Board when the Board is not in session or when it is impracticable to assemble the Board. The Executive shall report all its actions to the Board, which may be revised or altered, provided that no rights or acts of third parties shall be prejudiced. The Compensation Committee is tasked to develop a policy on remuneration of directors and key officers of GT Capital and to ensure that their compensation is consistent with the Corporation’s culture, strategy, long-term interests and the business environment in which it operates. The Nominations Committee is responsible for the evaluation of the qualifications, experience and areas of expertise of each individual nominated for election to the Board of GT Capital. The Nominations Committee is also tasked to ensure that a process is in place that identifies and develops highly qualified individuals to take on key Board and Board committee positions whenever vacancies occur. The Nominations Committee promotes a policy on diversity; and provided that all qualifications are met, ensures that in the nomination of candidates, no discrimination is made based on gender, age, ethnicity, nationality or background, whether social, cultural, political or religious. In reviewing and evaluating the qualifications of candidates for nomination to the Board, the Nominations Committee considers the Corporation’s vision, mission, corporate objectives, and strategic direction. The Nominations Committee also considers the skills and competencies of the currently serving directors, identifies the gaps in skills and searches for candidates to fill in these gaps. As a result, GT Capital’s Board is comprised of individuals coming from various fields and with a wide range of experience in business, finance and law as well as expertise in the industries in which the GT Capital’s component companies are involved in. The Nominations Committee also reviews the qualifications of candidates for nomination to key positions in the Corporation which require appointment by the Board of Directors. In order to fulfill its role, the Nominations Committee is guided primarily by the qualifications, disqualifications, and the policies contained in the CG Manual and its Charter, as well as applicable laws, rules and regulations. The Committee has the option to use an external search agency or external databases in identifying qualified candidates to the Board. As of May 10, 2017, the Nominations Committee is composed of a majority of Independent Directors. The Audit Committee exercises oversight responsibility over the financial reporting process, system of internal control, audit process, and the monitoring of compliance with applicable laws, rules, and regulations. The Audit Committee also oversees the Corporation’s external and internal auditors and is responsible for the review of the audit and non-audit fees paid to external auditors. In compliance with GT Capital’s Manual on Corporate Governance and PSE’s Corporate Governance Guidelines for publicly listed companies, the Audit Committee and the Risk Oversight Committee jointly certify, on behalf of the Board of Directors, the adequacy and effectiveness of the Corporation’s internal controls and risk management system, and hereby attest that the Parent Corporation’s governance, risk management, and control processes are adequately designed and operating effectively relative to its business objectives. 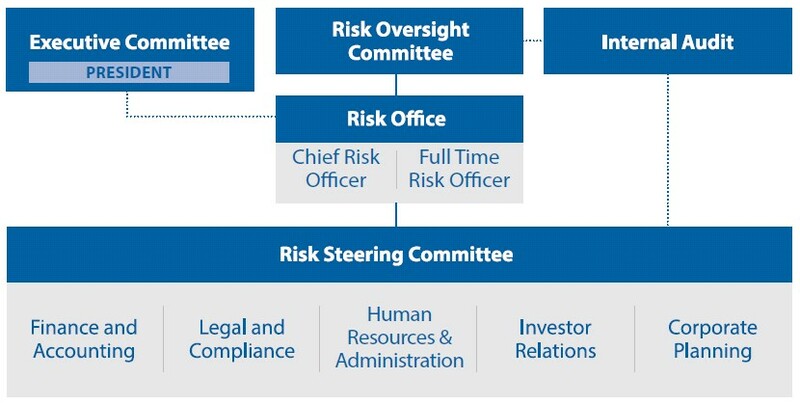 The Risk Oversight Committee is responsible for institutionalizing and overseeing the Company’s risk management program and for monitoring the risk management policies and procedures of GT Capital’s subsidiaries in relation to its own. Its powers, duties and responsibilities include, among others, identifying, assessing and prioritizing business risks, developing risk management strategies, overseeing the implementation as well as reviewing and revising GT Capital’s Risk Management Plan, recommending to the Board policies and guidelines to address unforeseen risks and creating and promoting a risk culture that requires the highest standards of ethical behavior among all personnel. The Corporate Governance and Related Party Transactions Committee is tasked with ensuring the Board’s effective and due observance of corporate governance principles and guidelines. The Committee is also responsible for assessing and endorsing to the Board of related party transactions with material significance. The policies which guide the Corporate Governance and Related Party Transactions Committee are found in the Corporate Governance and Related Party Transactions Committee Charter. In 2017, there were no RPTs that can be classified as financial assistance to entities other than wholly-owned subsidiary companies of GT Capital. All RPTs are conducted fairly and at an arm’s length basis. Further discussion on the RPTs of the Corporation can be found under Note 27 of the Corporation’s Audited Financial Statements. GT Capital’s Corporate Secretary, Atty. Antonio V. Viray, has extensive experience in legal and company secretarial practices. As Corporate Secretary, he plays a significant role in supporting the Board by working fairly and objectively with the Board, Management, stockholders and stakeholders and by contributing to the flow of information among each other. The Corporate Secretary likewise keeps himself abreast will relevant laws, rules and regulations and industry developments necessary for the performance of his duties and responsibilities in order to effectively advise the Board on significant issues as they arise. He ensures reasonable access to information that directors might need for their deliberation of the issues listed on the Board’s agenda. This includes ensuring that members of the Board receive the requisite board materials at least five (5) business days in advance of the scheduled Board meeting. In order to attract and retain the services of the most qualified and competent directors and officers, GT Capital’s Compensation Committee ensures that competitive compensation is offered. Annual compensation of directors and corporate officers of the Board are determined prior to the start of their term. Policies followed by the HR and Administration Department on compensation and benefits of employees are contained in its Policies and Procedures Manual, with a description of each benefit as well as the employees entitled to such benefits. Remuneration of directors (including Independent and Non-Executive Directors) consists of per diem as well as a year-end bonus which is not dependent on performance. Directors do not receive any remuneration in the nature of options or performance shares. In order to provide an understanding of GT Capital, new directors are oriented regarding GT Capital’s core businesses. A budget is also in place for continuous professional education to ensure the continuous effective performance of their functions and to keep its directors abreast of relevant and latest developments. In 2017, directors of the Corporation attended various programs on corporate governance. The Internal Audit function of GT Capital is under the responsibility of its Chief Audit Executive (the “CAE”), Richel D. Mendoza1. At the start of the year, a risk-based audit plan is prepared and approved by the Audit Committee. Progress of the plan as well as significant audit findings are reported quarterly to the Audit Committee and Board of Directors. The CAE also ensures that risk-based audit plans are prepared at the component company level. Progress of these plans and significant audit findings meeting the Group’s escalation criteria are reported by each component company’s Internal Audit Head to the CAE on a quarterly basis. These reports are consolidated and reported to GT Capital’s Management and Audit Committee. As mandated by the Internal Audit Charter, to maintain the independence of the internal audit process, the CAE functionally reports to the Audit Committee and administratively to the President. The Audit Committee is thus responsible for the appointment, performance evaluation, and removal of the CAE. In March 2018, independent auditing firm, KPMG, confirmed to Senior Management, Audit Committee and the Board of Directors that the Internal Audit Division “generally conforms” (the highest classification on conformity) to the requirements of the International Standards for Professional Practice of Internal Auditing (ISPPIA) and the Code of Ethics based on their external quality assessment review. 1 Ms. Richel D. Mendoza was the CAE of GT Capital until March 01, 2018. She was replaced by Mr. Leo Paul C. Maagma effective April 16, 2018. Sycip, Gorres, Velayo & Company (“SGV”) was the external auditor for the calendar year 2017. GT Capital is compliant with SRC Rule 68, Paragraph 3 (b) (ix) (Rotation of External Auditors), which states that the independent auditors, or in the case of an audit firm, the signing partner, shall be rotated after every five (5) years of engagement, with a two-year cooling off period to be observed in the re-engagement of the same signing partner or individual auditor. The following SGV partners were engaged by GT Capital since its listing in 2012. In compliance with the aforementioned SRC Rule, the signing partner for 2018 shall be subject to rotation. Audit services rendered include the audit of the financial statements and supplementary schedules for submission to SEC, and review of annual income tax returns. SGV also rendered audit-related professional services in 2016 relating to the Company’s Perpetual Preferred Shares Offering amounting to Php 9.29 million. Non-audit services were also provided by SGV for validation of stockholders’ votes during the Corporation’s Annual Stockholder’s Meeting. Tax consultancy services were secured from other entities. The Audit Committee has the primary responsibility of recommending to the Board of Directors the appointment, re-appointment or removal of the external auditor and the fixing of the audit fees. The Board of Directors and stockholders approve the Audit Committee’s recommendation. GT Capital’s financial statements comply with Philippine Accounting Standards and Philippine Financial Reporting Standards and are submitted and disclosed in compliance with the applicable laws, rules and regulations. GT Capital did not revise its financial statements in 2017. Grand Titan Capital Holdings, Inc.
No director or officer has shareholdings in GT Capital amounting to 5% or more of its outstanding capital stock and there are no cross or pyramid shareholdings. Inculcated in all GT Capital employees is a culture of excellence and professionalism. GT Capital values the efforts and contributions of all employees, recognizing that these result in the overall success of the Corporation. Policies on employee health, safety, welfare, discipline and training are stated in the Employee Handbook, which is provided to all employees of GT Capital upon hiring. The Policies and Procedures Manual of the Accounting and Financial Control Department outlines GT Capital’s policies on creditor protection, which include policies on ensuring timely payment and compliance with loan covenants contained in loan agreements, to which GT Capital complies with. The prospectus of each of GT Capital’s existing corporate fixed rate bonds also includes provisions for the protection of bondholders, including the appointment of a trustee bank to act on their behalf. To carry out its commitment to creating value for its stakeholders, GT Capital takes a long-term and sustainable perspective in all of its business decisions. GT Capital believes that its strong economic performance should be complemented with being socially and environmentally sustainable, as well as implementing responsible business practices. During the first quarter of 2018, GT Capital held a two-day Sustainability Kick-off Workshop for its senior officers and employees facilitated by the Center for Social Responsibility University of Asia and the Pacific. The workshop focused on equipping its attendees with in-depth knowledge on GRI Standards, which provide a common language for reporting organizations and stakeholders on the economic, environmental, and social impacts of reporting organizations. The workshop was followed by the formation of a technical working group within GT Capital which shall spearhead the creation of GT Capital’s maiden Sustainability Report to be released in 2019. Through the Sustainability Report, GT Capital aims to provide its stakeholders with globally comparable information affecting its triple bottom line. GT Capital likewise regards the endeavor as a risk management and a strategic initiative for the Corporation, as sustainability reporting may identify potential opportunities or trends or evaluate emerging risks, allowing GT Capital’s Board of Directors and Management to take timely action. With these efforts, GT Capital takes an important step towards its vision of becoming a major contributor to nation building, with the aspiration to continue making sustainable decisions beneficial to the present and future generations. GT Capital monitors its subsidiaries regarding its policies on the welfare and safety of its end-customers as well as its initiatives regarding environmental sustainability and corporate social responsibility. 3. Waste Management and Segregation Seminar at the Toyota-City of Santa Rosa-Gawad Kalinga Village, where 75 local residents were trained on proper waste disposal and segregation. High environmental performance of dealers is ensured through the Dealer Environment Risk Assessment Program that paved the way for the ISO14001:2004 certification of 16 Dealerships to date. At the same time, to ensure that parts installed in vehicles are free of hazardous substances, suppliers are enjoined to strictly follow the Toyota Green Purchasing Guidelines. Managing environmental impact is done through strict compliance with the requirements of the Department of Environment and Natural Resources, Laguna Lake Development Authority and other regional and local government agencies. To this end, TMP aims to update its existing environmental management system to the ISO14001:2015 standard within 2018. All these activities are aligned with the Toyota Environmental Challenge 2050 where TMP commits to the elimination of CO2 emissions, optimization of water usage, material recycling, and other goals by 2050. TMP actively promotes its environmental initiatives during the Environment Month Celebration held every June. Activities such as tree planting, relays, slogan-making and poster-making contests, and an eco-science tour are designed to promote environmental awareness among the Team Members and the community. Toyota Manila Bay Corporation (“TMBC”) has a high regard for environmental awareness, safety and health, which is visible in the firm’s mission statement to contribute to the growth of the city, society and the automotive industry. To achieve its mission, TMBC created the Environmental, Safety and Health (ESH) section and the Real Property and Development (RPD) section. The ESH section aims to protect and preserve the well-being of its team members, principals and clients, as well as the community to which it belongs, while the RPD section aims to ensure sustainable development through construction of eco-friendly and up-to-date facilities. 1. Ensuring, through the ESH section, that the firm complies with all governing rules and regulations of local and national government related to the environment, safety and health. In line with this, the ESH section has a monitoring system to ensure monthly, quarterly and annual compliance per branch, which compliance is verified by TMP’s DESH team. 2. In January 2016, the Toyota Dasmarinas branch was the first car dealership in the provincial category to secure an ISO 14001 Version 2004 accreditation. Likewise in June 2017, TMBC’s Toyota Abad Santos branch was the first among NCR car dealers to secure ISO 14001 Version 2015 accreditation. 3. Construction of a nine (9) story building for its Toyota Manila Bay branch, which obtained LEED accreditation certification in October 2017. The building saves electricity by 10% and water consumption by 20% following the design standards of USGBCI LEED program. 4. Ensuring, through the RPD section, that all equipment installed in its new facilities are environmentally-friendly and in accordance with the National Building Code and relevant DENR policies, including the construction of self-maintained water treatment facilities. TMBC likewise aims to achieve zero water discharge in all its facilities. 5. Patronizing safety, through its ESH section, by commending team members who adhere to the safety rules and regulations at all times. These safety rules and regulations include programs such as the Caught in the Act program, Dealership inter-branch competition: Lowest Accident Rate, Hiyari Hatto incentive program, ESH day and Safety Circle, among others. Additionally, TMBC has an existing Business Continuity Plan and Emergency Response Team per branch. Through the combined efforts of the ESH section and TMBC’s employees as well as with the support of its principals, each TMBC dealership has embedded safety, health and environmental awareness in its culture. Moving forward, TMBC shall continue to strive to exceed its current achievements in order to secure the future of the Company, its team members and the society where it belongs. In its commitment to build homes and communities that transform lives, Property Company of Friends, Inc. (“PCFI”) prioritizes the welfare of its customers and the environment. PCFI’s practices of promoting customer protection and safety while maintaining an environmentally-friendly value chain exemplify the company’s values and good corporate citizenship. To ensure that buyers are properly educated with the purchases they are making, PCFI sets aside time to conduct mandatory counselling sessions with all buyers who reserve housing units, including buyers who may have been referred by external third party sales networks. PCFI discusses transaction details from pricing, payment schedules, documentary requirements, and financing options. The counselling session is also a venue for buyers to raise any potential questions they may have about their reservation. PCFI has started incorporating sustainable practices in its business. 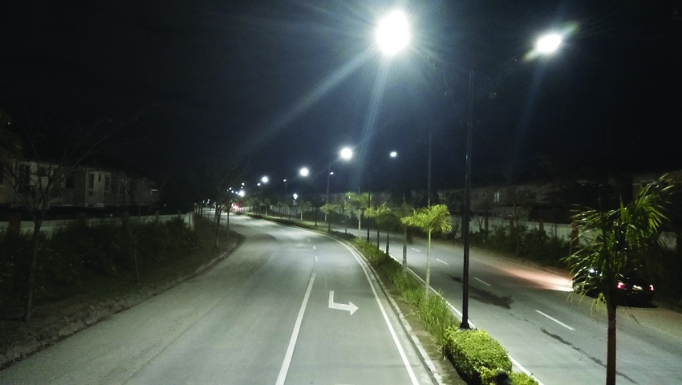 A solar street lighting system has been adopted in PCFI’s flagship development, Lancaster New City (“LNC”) where over 600 solar-powered light-emitting diode (“LED”) lights have been installed across primary and secondary roads. Unlike traditional streetlamps, solar-powered LED lights simulate sunlight more closely and provide better visibility at night, which prevents road accidents and other unwanted events. PCFI also employs solar-powered work lights in its construction sites. To minimize waste and carbon footprint, PCFI is also working towards the implementation of a Zero Waste Management Program. In its construction sites, PCFI follows a disposal scheme where scrap materials are collected and sorted according to class (i.e. metals, glass, and plastic) in appropriate locations. Scrap items are then recycled or systematically bid out as deemed fit. Meanwhile, across PCFI villages, homeowners are encouraged to segregate their garbage into biodegradable, non-biodegradable, or hazardous waste which is then collected and processed in a Materials Recovery Facility (MRF). Non-biodegradable waste is further segregated and taken to a treatment facility before being dumped in a landfill while biodegradable items are processed into compost. 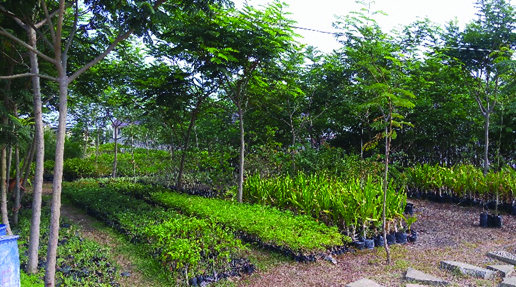 PCFI’s communities are home to 72 different plant species and about half of these are indigenous to the area, such as molave, copper pod, kamagong, dita, ilang-ilang, banaba, and pink tabebuia. As of the end of 2017, a total of 26,302 trees form part of Lancaster New City’s streetscapes, linear parks, and open spaces. PCFI implements tree care practices including pruning, pest and fertilizer management and installation of tree supports to ensure that all trees will survive, grow and reach their full potential. 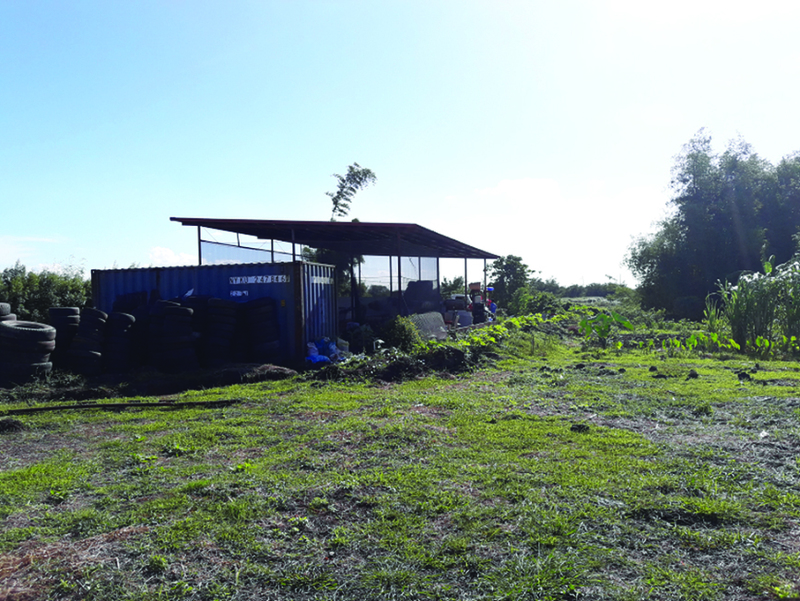 PCFI also boasts of its central nursery in Cavite which has produced more than 20,000 seedlings in 2017. Lancaster New City celebrated its 10th anniversary in 2017 and launched “Go Green Lancaster”, a tree-planting campaign which aims not only to promote greening activities within PCFI groups and employees but also involve the residents and homeowners in each community. The tree-planting campaign aims to continue and even strengthen what Lancaster New City has been doing for the longest time, raising awareness and encouraging each member of the PCFI community to give back to the environment. During the campaign launch, 50 volunteers planted over 400 seedlings in specific areas of the township. Federal Land, Inc. (“FLI”) is committed to developing high quality real estate properties that are responsive to the needs of the diverse market. FLI keeps its clients’ interests in mind in planning and developing its products, while keeping pace with current trends. FLI has built its brand based on the trust of its customers and stakeholders. FLI will continue to create and develop properties that will become quality homes and communities for people and businesses, while providing the best returns and value to its shareholders. In its relationships with stakeholders, FLI shall be an environmentally responsible neighbor in the communities where it operates and shall act promptly and responsibly to correct incidents or conditions that endanger the environment or the health and safety of the residents within its surrounding communities. In its operations, FLI shall ensure that its developments will comply with all applicable environmental laws and regulations and shall be conscious of conservation measures available within its property and community. It is FLI’s policy to not dump wastes or apply highly toxic chemicals on any parcel of land whether owned or not and have ample distribution of greeneries in its developments. Policies on conducting regular water potability tests and institution of energy conservation projects are also in place. Integral to GT Capital’s business is corporate social responsibility and environmental sustainability. The Commitment of GT Capital is seen in the activities of the entire GT Capital Group, in particular, Metrobank Foundation, Inc. (“MFI”) and GT Foundation, Inc. (“GTFI”). MFI aims to contribute to achieving sustainable and developed communities while recognizing the efforts of individuals who are integral to nation-building. GTFI invests in strategic programs that advance the development of underprivileged communities. The advocacies of the GT Capital Group are discussed in the Corporate Social Responsibility section while specific activities of MFI and GTFI are discussed in the Component Company Highlights section of the Annual Report. The Amended By-Laws of GT Capital provides for the second Wednesday of May of every year as the date of the Annual Stockholders’ Meeting (“ASM”). The notice of ASM, including the details of each agenda item, is released through a disclosure to the Philippine Stock Exchange at least twenty-eight (28) days before the date of the ASM. The notice of ASM includes the agenda, the record date, the date, time and place of the ASM and the procedure for validation of proxies. The submission of proxies must be done at least ten (10) days prior to ASM. In accordance with the provisions of the Corporation Code of the Philippines, each outstanding common and voting preferred share of stock entitles the holder as of record date to one vote. GT Capital recognizes and values its fiduciary duty towards its investors. Crucial to the establishment and maintenance of the trust and confidence of its investors is transparency in systems and communications. GT Capital’s Investor Relations Department aims to impart a thorough understanding of GT Capital’s strategies in creating shareholder value. The Investor Relations Department compiles and reports relevant documents and requirements to meet the needs of the investing public, shareholders and other stakeholders of GT Capital, fully disclosing these to the local stock exchange, as well as through quarterly media and analysts briefings, one-on-one investor meetings, the annual stockholders’ meeting, road shows, investor conferences, e-mail correspondences or telephone queries, teleconferences, its annual and quarterly reports, and GT Capital’s website. All shareholders, including institutional investors, are encouraged to attend stockholders’ meetings and other events held for their benefit.